Not the garden-variety “belter of show tunes in the shower” type of singer, and certainly not the “queue for hours to get your face on national telly” kind of singer either. A semi-decent singer that was sometimes paid to attend community festivals way out west and to sing old pop songs to a dedicated audience of children and a far less dedicated audience of passers-by. We did covers of 90s pop and rock. Â When no-one was paying too much attention, we’d do “Mmm-bop” by Hanson and laugh about it afterwards. Â We did Chirstmas Carols in various parks around Sydney suburbia in the stifling heat. And then we stopped just as suddenly as we’d started. There was, you see, meagre money to be made in the community concert industry, and we were growing up to become serious-adult-people. Â Well, I was growing up to become a member of the serious-adult-people, and my vocally gifted partner had decided that it was far more worthwhile working the mixing boards than being the mixed. All of which has quickly become a very long way to introduce the very first time I heard of rhubarb. If you forget the words when singing backups, miming “Cabbages and Rhubarb” always works. Â Especially if there’s more than one backup singing with you to carry the load. It served me well, that one piece of advice, through multiple choirs and the odd spot of backing vocals where I’d been told to join in on various lines to a song that I’d only heard once before… five minutes before the curtain rose. 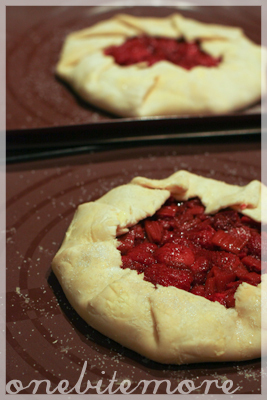 Far less difficult to remember is the recipe for the strawberry and rhubarb compote that makes up the base of this recipe. Â I’ve discovered, very recently, the joys of baking a medley of fruit tossed in sugar to make a compote. Â The fruit’s natural juices mill about and absorb the sugar while the oven softens the fruit just through. Even better, there’s no more mucking about with a pan and wooden spoon, worrying about bits of fruit catching on the bottom and squishing all of those lovely shapes into an unidentifiable mush. Â No sir-ee! The best thing about baking, though, is the quantities of compote that can be made with very little effort indeed. 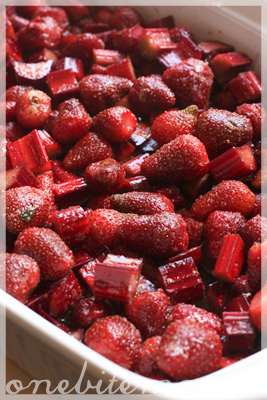 Â I used the remainder of my two-bunches-of-rhubarb-and-five-punnets-of-strawberries to make a whopping tray of compote and used it every other which way in a medley of drinks, desserts and breakfasts (the remaining recipes for which I’ll reveal in coming weeks). 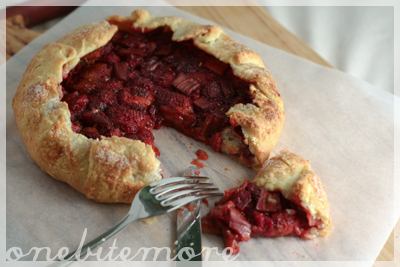 This galette though… Oh my! It absolutely won my heart. 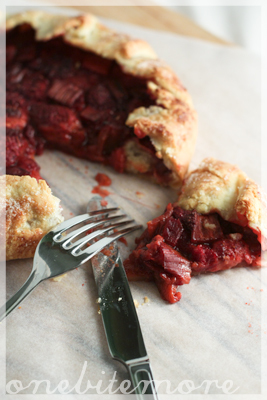 Â Light flaky pastry (thanks to a very slightly amended version ofÂ Smitten Kitchen’s galette pastry recipe) housing a juicy, warm, sweet-and-tart filling with that wonderful vegetal flavour that rhubarb brings to desserts. Or, for that matter, breakfast. Which is how we ate it the next day. Â A dollop of honeyed natural yoghurt making the perfect accompaniment to what is certainly a not-so-borderline appropriate breakfast on a sunny Sunday morning. 1. 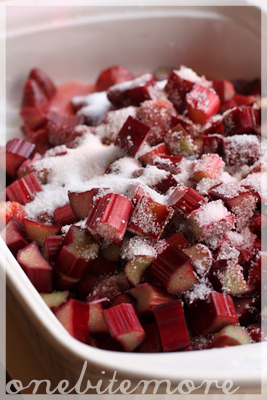 Wash the rhubarb thoroughly, discard the leaves and ends and chop the stems into 1cm lengths. Â Wash and hull the strawberries, halving any that are particularly large. 2. 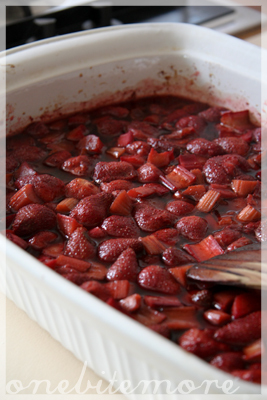 Toss the remaining ingredients through the fruit mixture and place in a 180C oven for 25 minutes. 3. Remove and let the mixture cool. Dollop on yoghurt, over ice-cream or on cereal. 1. Strain the compote through a sieve, retaining the ruby red syrup for other uses. Â Set the strained fruit aside. 2. 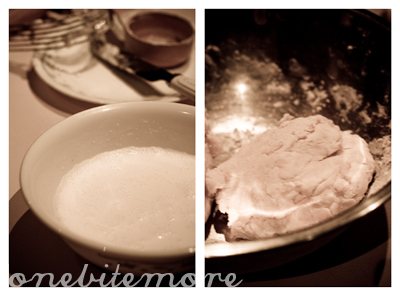 To make the pastry, dice the butter and work it through the flour and salt with a pastry cutter. Â If you don’t have one of these, rub it into the flour with your fingers. Â Stop when the flour takes on a yellowish tinge and there are pea-sized blobs of butter remaining scattered throughout the flour mixture. 3. 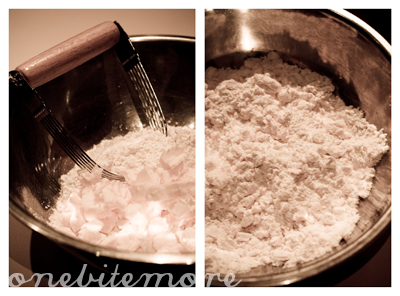 Mix the sour cream and water in a bowl until they form a consistent sludge and tip it into the flour bowl. Â Mix with a spatula until it just comes together. Â Work it a little with your hands to incorporate the flour, but being careful not to overheat the dough and allow the butter to melt. Â Pat the mixture into two round discs, about 1cm thick, wrap in cling wrap and rest in the fridge for an hour. 4. 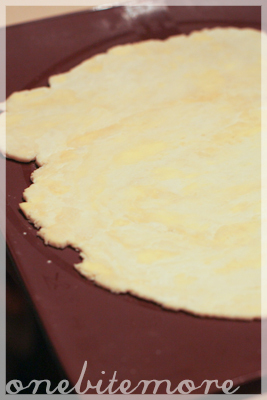 Roll the dough out on baking paper or a silicone mat until it is 2-3mm thick. Â You will see streaks of yellow butter throughout the dough. Spoon half the strained compote mixture into the centre and fold the edges around it roughly to form an open tart. Â Repeat with the remaining dough & compote. 5. Brush the exposed dough with milk and sprinkle demera sugar over the top, pressing it into the dough ever so gently. 6. 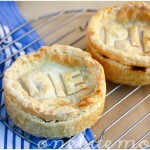 Pop the galettes into a 200C oven for about 30 minutes, or until the pastry is golden and puffed up. 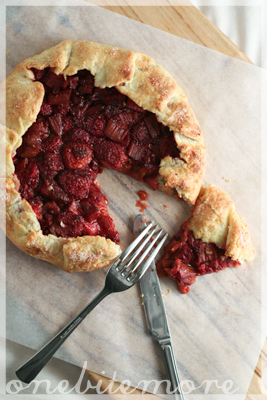 Love the strawberry and rhubarb combination! 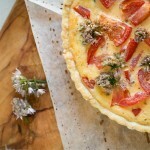 I love the colour of the galette, gorgeous. So not just talent in the kitchen, singing talent as well!! 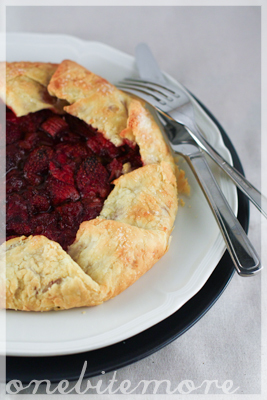 I can only imagine how tangy yet sweet this galette is! looks great! 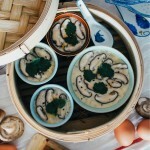 Weekend breakfasts are not subject to the usual breakfast-appropriateness rules. That is, if you normally follow those rules anyway. Or if you normally eat breakfast.